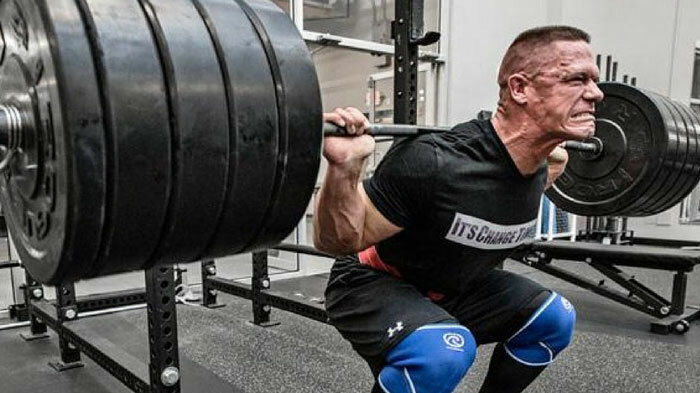 Bigtimerz - The 8 gym rules John Cena lives by | Want a body like him? Written by the Providr.com editorial team. John Cena is one of the biggest WWE Wrestlers in the business and is pretty much the face of the organization. He’s been in the game for over a decade and he is still in peak condition. But his routine isn’t a secret, in fact, you can now get his body by following his 8 important gym rules. 1) Squats are one of the more important exercises for the wrestler. Whether you like it or not, it’s important to always get a few squats in every gym session. This is the one thing that Cena says you can’t do without. 2) Instead of shying away from the weaknesses, you should embrace them. The athlete knows that he has some weaknesses and he faces them head on. ‘I’m hamstring-deficient. It’s the way I am. If you’re like me, develop a program to build up your hamstrings. Don’t fake it,’ he says. Sure, you might struggle to lift the weights but at the end of the day, you’re going to be training that muscle until it’s at par with the rest of your body.